Do you face the hurdle of not being able to charge your precious electronic gadgets when you are on a long trip? This issue seems to get worse when you go camping in the woods. However, by the time you are done with this article, that hurdle is likely to be overcome. That’s because, in this article, we are going to cover up Solar Power Banks. To begin with, a Solar Power bank is an energy-efficient and portable solution. As a result, it is extremely useful when you don’t have access to an electric socket. This often happens when you are traveling, or while you are on an outdoor adventure such as trekking or camping. 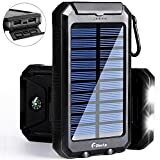 During such times you can use a Solar Power bank to conveniently charge your gadgets. 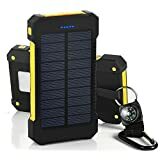 Below listed are some of the best solar power banks that you need to check out if you haven’t already done that. This portable solar power bank is waterproof and shockproof. Also, this power bank can simultaneously charge multiple devices as it comes with two USB power ports. So, you can charge your phone and also plug in your Bluetooth speaker at the same time. As a result, it makes using electronic gadgets convenient wherever you go. Moreover, it is compatible with all sorts of devices such as Androids and iPhones. The Hiluckey Solar Power Bank is a versatile power bank with a 10,000 mAh power capacity. This device also has a dual USB port system, and as a result, it can charge two gadgets simultaneously. What makes it a great option for outdoor enthusiasts is its LED flashlight and water-resistant properties. Above all, the company also provides a one-year warranty and money back policy to its customers. This travel-friendly solar bank is capable of charging two devices at once, and that too at the rate of 1-2.1 Amperes. This product is made from a Silicone material and comes with two LED flashlights that work on different modes. As a result of its 10000 mAh charging capacity, you can charge your devices quickly and more effectively. Additional features include a hanger to hang your travel bag and a compass to navigate during your trips. This Eco-friendly and travel-friendly power bank supports all types of devices. Moreover, it is not only dustproof and waterproof, but also shockproof. This product comes with three USB ports and therefore lets you charge three gadgets simultaneously. Not to mention that it supports a maximum of 2.4 Amperes per port, which is good enough. This power bank also protects gadgets from harm caused due to overcharging, etc. 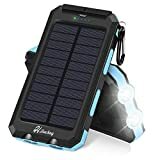 This waterproof and dustproof solar panel charger features two USB ports that let you simultaneously charge two devices. It is a portable charger that comes with a charge capacity of 15000 mAh. A point to note is that it operates faster with DC inputs. Also, it comes bundled with an LED flashlight, which can be turned on and off through the power button. 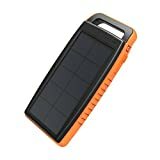 This solar power bank is equipped with an 8000 mAh charging capacity, which is sufficient to charge an iPhone at least 4 or 5 times. It is made up of eco-friendly products and comes with a power indicator. Some of its additional features include a 21 piece set of LED lights, and this makes it a very bright flashlight. Also, it comes with a hook, and therefore it can easily be hooked to bags, etc. during trips. It can simultaneously charge three devices via its three USB ports. Made entirely of silicon, PC, and ABS material, this hi-tech power bank features an advanced auto-stop feature. Due to this feature, it stops supplying power to your phone when it is fully charged. This power bank has a 20000 mAh battery capacity, and therefore, it can supply more power. Besides that, it is dustproof and waterproof as well. Not to mention that it also features two powerful LED lights and a compass, which are great add-ons while traveling. Finally, it comes with an indicator that displays how much has the sunlight or electricity charged the device. 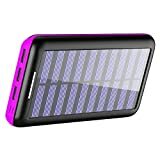 This 20000 mAh solar power bank is not only suitable to charge devices but is also loaded with other functionalities. These include LED Light and a water-resistant body, as a result, it is perfect for an outdoor trip. Above all, this power bank also has an SOS flashlight and a compass, making it travel-friendly. Not to mention that this sleek power bank is available in black color and charges at the rate of 1A or 2A. 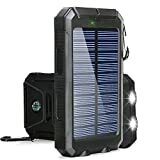 This device consists of four powerful solar panels, and as a result, you have a highly efficient power bank with 10,000mAh battery charging capacity. Above all, this fantastic product comes with a one-year warranty from iBose. However, the most noteworthy feature of this power bank is its ability to adjust the power supply. Therefore, you can be sure that this power bank prevents your device from overheating. Finally, we come to the best pick on our list, the Ayyie Solar Power Bank. This is a beautiful alternative to electric sockets and therefore brings great relief while you spend time outdoors. As a result, this power bank is extremely useful when you go out on trips, hikes, and camps. 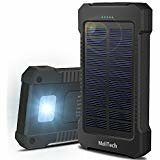 With its dual USB support and flexible material, this solar power bank automatically prevents overheating. Moreover, it comes with an indicator that helps determine the status of the remaining power. As a matter of fact, this power bank has a total capacity of 20000 mAh and a 2.1A port charging capacity. This is considered to be a very durable product. 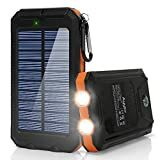 Therefore, a power bank that works with solar energy is an excellent option for those who love to travel and simply can’t do without their devices. That being said, make sure to get a power bank with a sufficient charging capacity. We wish you a happy power bank hunt!